French Doors are a stylish and practical option that suits almost any application. A great choice when interior wall space is limited, the range of Southern Star Group French Doors has a customisable design to fit any home and style. French Doors make a bold statement with their expert design and classic appearance. They help create the lifestyle desired for any home with superior functionality and stylish looks with a variety of configurations available such as single door, double doors and the addition of sidelites. 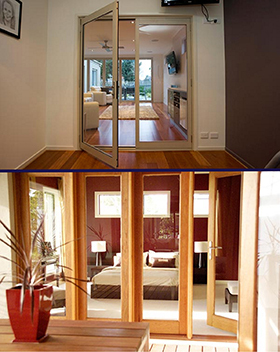 French Doors are available in aluminium from Southern Star Aluminium and Timber from Canterbury Timber. Offering contemporary styling, our French Doors are an elegant and practical way to open up your living area and allow wide access to a courtyard, garden or patio. Concealed self-draining sill with sub sill attached. Southern Star Aluminium French doors are offered in 100, 200 or 300 Series ranges. Canterbury Timber French Doors are available with options such as solid timber panels, large glass expanses or a variety of colonial bar configurations. A variety of glazing options are also available for both our Southern Star Aluminium and Canterbury Timber French Doors, with the 200 and 300 Series and the Timber product also offering a double glazed option. As with other door styles, a number of powder coat colour options are available for aluminium while timber materials include Meranti, Western Red Cedar and KD Hardwood.